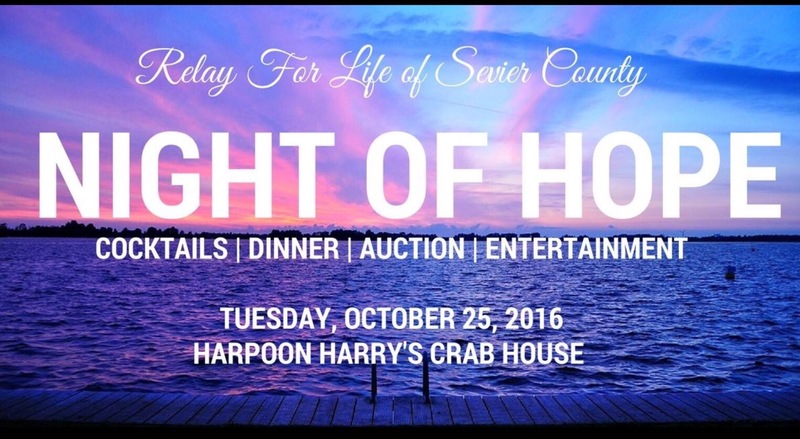 Relay for For Life of Sevier County and Harpoon Harry’s Crab House presented the second annual Night of Hope on Tuesday evening, October 25, 2016. This was my first Relay for Life event and it won’t be my last. Volunteers work hard in the fight against cancer so it is one of the most important causes that one could join. Here is what it was like. Janice and I arrived at little after the 6:30 start time and got all the information from our hostesses. The main thing for me to learn— the raffle tickets. There were both live and silent auctions which were easy and fun. In fact, Janice later won horse statuette for her granddaughter. The upstairs part of Harpoon Harrys can be open air in good weather. It was a great place for an event! A nice selection of gifts on the silent auction. I had my eye on the gift certificate from Oak Haven Resort, but let someone else get it (since I am already a monthly member there.) It was tempting! Please know that this was the best spread of cuisine ever! The $50 ticket price stopped right here for me. There was a lot of seafood to enjoy! Seasonal decorations and the ‘dry ice’ effect in the glasses. Festive! Kevin Ownby and his mother, Beverly Ownby, supporting Relay for Life. Kevin’s wife, Brooke Ownby, and her mother Louise Presley supporting Relay for Life of Sevier County . One of the auction items was a Palm Breeze Cruiser, donated by Cherokee Distributing Company. If there is another one next year then I must bid! This is part of the ‘Tuesday Night Sushi Group’ that meets at Harpoon Harry’s on Tuesday evenings. I must investigate this further some day. Pictured left to right: Fane Fisher, Eddie Fisher, Matt Converse, and Chuck Ottolini. They say that some of the sushi chefs here came from the former Shonos Restaurant in downtown Knoxville. You know that will be good. Save a place for me! Mayor Bryan Atchley gave a riveting talk about his experiences with cancer, both personally and with a loved one. It must have been harrowing. I can see where the Relay For Life group gives hope to those fighting the dreaded disease. We need to support them as much as possible. We joined the Tuesday Sushi Group and enjoyed the rest of the evening. They know sushi! In my opinion, the meal was worth double the ticket price that I paid. Unbelievable. Sophia Conerly, lead event Chair, making announcements. What a great job this team does. Their devotion to the fight against cancer is inspiring. Margit and Earl Worsham, pictured here with Sophia Conerly, supporting Relay For Life. Who wants to play corn hole? These sets auctioned well. The drawings were fast paced and fun to watch. If I owned a cabin then these would be on my walls right now. My favorite surprise of the evening—meeting Jim Bates, pictured here with Mayor Bryan Atchley. Jim Bates is the father of James and Jeremy Bates, S.C.H.S. alumni. He is visiting from Tampa. I heard Mayor Atchley introducing Coach Bates and had to meet him at the end of the evening. As an intro, I asked,”Are you James Bates dad?” So nice to meet him! It was soon time to go. I noticed that the weather was still warm for late October as we passed by the open windows at Harpoon Harry’s Crab House. It was such an easy, relaxing, enjoyable event. It is a must-do event each year for me from now on. The Relay For Life Night of Hope completely exceeded all expectations and I look forward to attending next year. In addition, I hope to do more to help this group in their efforts to fight cancer. Ultimately, the theme of the evening was bravery, dignity, and survival. They deserve everything that we can give them. Sevierville 7 Day Planner: October 18-25, 2016. Seven events in 8 days! Lots to see and do. If you want me to share your event then the best way may be to send me an announcement via Facebook. Three new events happen this Thursday. 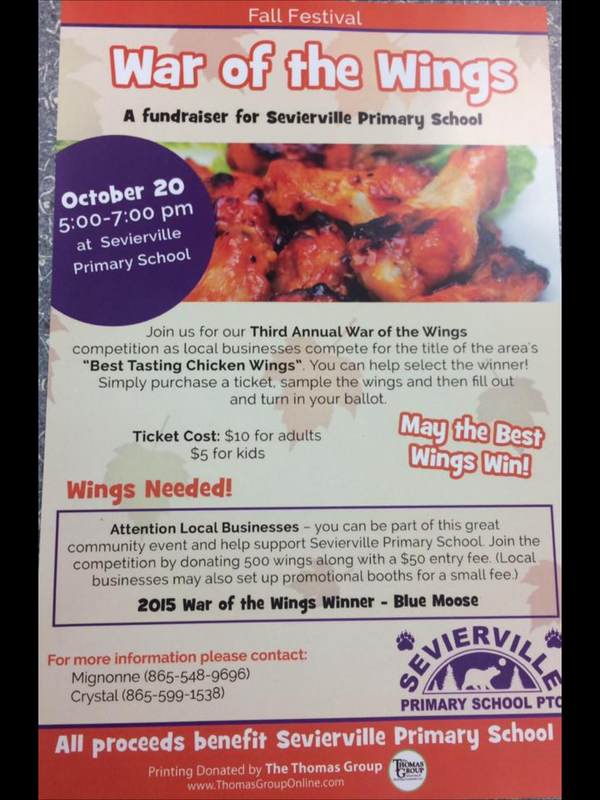 Blue Moose won the War of the Wings last year. My sister, niece, and nephews love that place. $10 to sample the best wings in the county! Good luck to all teams. Also Thursday, a 95th birthday party for Lorraine Hendricks will take place at Courthouse Donuts from 4-7:00 pm. Read the Sunday Mountain Press article by Stan Voit to learn her story more in depth. In brief, she was involved starting many valuable programs in our county, starting with the Boys and Girls Club of the Smoky Mountains. I feel like going to say ‘thank you’ too. There were only a few seats left for this event tomorrow night so call soon if you are interested. There are a lot of things going on to get us out and about in Sevierville. About 14 years ago, the band director for the Alabama Crimson Tide Marching Band (the Million Dollar Band) called Doc Ramsey to ask if they could use the football field to practice their halftime show before heading to the UT Knoxville football game. Doc said yes, unlocked the gates for them himself, and a new tradition was born. On home games against Alabama, you can go to the Smoky Bears stadium around 10:30 a.m. to see one of the best bands in the SEC. Eight buses and at least one 18 wheeled equipment truck. The percussion section moving equipment down to the field. I counted over 6-8 xylophones. A view going in from the visitors section. The band covers almost half the field. I heard that there were over 450 band members this year. Lunch was set up and ready to go from our local Chic-filet. Terry said that band members are extremely polite, eat quickly, and are ready to head over to Neyland Stadium. There was a lot of crimson and orange in the stands watching pieces of the show. The legendary Doc Ramsey was at the top helping in the press box. He told me the story in the first paragraph above. He was the contact person for the Alabama band director years ago when this started. Majorettes are in front. Color guard in the back of the end zone. View from top of Burchfiel Stadium. View from the very top of the stadium. I see the lunches waiting on the table in the left part of the picture. The mountains are beautiful in the background. Is that Mount Leconte? The bear statue is safe atop the SCHS gym. On my way out, I had to get a picture on the side of the equipment truck. That is quite a nickname! Finally, I ran an errand then waited along the parkway to see the famous motorcade that escorts the band out of town to the game. People told me that it is quite a sight. I waited quite a while. A long time. Then, I realized that the band must have left earlier than the. I gave up and drove home. As I got to the last red light on the way home, Allison texted that the band had just left. I was only about 10 seconds from turning off to my street from Chapman Highway when I heard a siren. An officer pulled around me and stopped in the intersection. I looked up into the rear view and saw the motorcade coming quickly toward me. It was a God moment because I had given up on seeing the motorcade. But He put his hand on it and placed me right in the middle. It was an amazing sight! Someone will probably notice how I jump into the car quickly when the second motorcycle officer comes speeding up behind me. Don’t try that if you find yourself in the middle of a motorcade. This was a fun and very different kind of morning to be out and about in Sevierville! With the first fall break ever, it was a free day to visit the last downtown Sevierville farmers market of the year. Sunny and 70 degrees made a nice day to end the market run for this year. First, I met Elaine, Janice, and Anita at Courthouse Donuts for coffee and a ‘catch up chat.’ Then we headed out to the market. Here is what we saw. Misty Benson transferred natural dye directly from plant to fabric. See the small, hammer- like tool used to lightly pound a fern leaf onto 100% cotton? Then use vinegar to ‘set’ the image so it won’t wash out. Guess what this design is from? A kudzu plant leaf. Also available were metalworking/blacksmithing gifts. Next artist, Andrea Wilson was pulling print etchings for this artist. Fun for kids at the downtown Sevierville Farmers Market! Artist, Kelly Sullivan, demonstrates pottery techniques. Here are some of our farmers market vendors this year. Jackie Diaz lives in Sevierville now. Mike lives in Sevier County. Patsy lives in Sevierville. If you want to order some animal figurines as a holiday gift or something then her email is fgsaints@gmail.com . I am emailing her some pictures for gifts. My friends and I headed back to Courthouse Donuts for lunch. Get a window seat so you can watch the comings and goings downtown. One friend said that the chef salad was excellent. Another friend ordered the chicken salad sandwich. It is fabulous! Afterward, we walked a block to Treasures From the Heart to shop. We looked at dresses first. Lots of nice ones there now. This one caught our eye. The ‘show stopper’ dress is still here! Of course, I checked out all the glassware again. It was a nice walk to the car after a day with friends out and about in Sevierville. See you downtown at the Holiday Market on December 1st and 2nd. Stay tuned for more details forthcoming! It was a nice evening downtown Sevierville at the third Art Happening, presented by the Sevierville Commons Arts Council. There were quite a few new faces at this event at Dyers Downtown. Music, art, snacks, presentation of the featured artist, and talks by Y-12 Credit Union and a representative from the Knoxville Entrepreneur Center completed the fast paced evening. Featured artist for October is Nelson Ziegler, a painter and artist who created the wood pieces featured at the top of this story. They were stunning! Ziegler is also an award winning watercolor and oil painter. He graduated from the Art Institute of Boston and Northwestern Academy of Watercolor. Below are some examples of his paintings. Arts Council member, and recent Art Happening featured artist, Jill Greene, left. Nelson Ziegler, featured artist for October 2016, on the right. I must take photography classes from Jill some day! Music performance by Stephen Goff and Tryphena Layman. See more of them at Harpoon Harry’s in Pigeon Forge. Look for Stephen Goff and the Royals. His contact info is SmokyMountainEventSource.com . Below is a moment from their set. Sevier Commons Arts Council President, Laurel Kiewitt, pictured left. Andrea Willson, also an Arts Council board member, pictured right. Christina Crofoot, an artist and Outreach Co-ordinator for SCAC (Sevier Commons Arts Council). Arts Council President, Laurel Kiewitt, addresses the group. My friends, Sheley and Joey Rose of Sevierville, enjoying the evening. Local artist and art-preneur, Chuck Ottolini, pictured left. Christina Crofoot, center. Jim McGill, Executive Director of the Sevierville Commons Association and Membership Co-ordinator of the Sevierville Chamber of Commerce. We really enjoyed this duo and hope to hear more of them soon! Keener Shanton, and his sister, Stephanie Shanton, supporting the Sevierville Commons Arts Council. These SCHS alumni have been keeping busy! Keener is Head Distiller at Old Forge Distillery in Pigeon Forge. Stephanie is a high school Biology teacher at Signal Mountain High School. Chuck and Keener talking art. Joy O’Shell, Outreach Director of the Knoxville Entrepreneur Center, talks with artists in a brief presentation. The Sevierville Commons Arts Council just received a grant from the center to provide opportunities for local artists. This is great news! Brandon Cole and his mother, Crystal Lynn Sharp. She is Volunteer Co-ordinator for the Sevierville Commons Arts Council. Rusty Curtis and Natalia Spratlen, representatives from Y-12 Federal Credit Union, gave information especially helpful to art-preneurs. Refreshments from Courthouse Donuts! Sheley loved the chicken salad and will come back for lunch some day soon. As I was leaving, I noticed attendees outside looking at the window art and conversing with the artist who created them, Crystal Sharp. People were standing outside enjoying nice temperatures and fresh air while enjoying conversation and paintings. This is what a great downtown can be. It is happening now. Our downtown is ‘on its way’ and the Sevierville Commons is driving this revitalization. As the picture below shows, the Sevierville Commons Arts Council is also helping to lead the way. The Sevierville Commons Arts Council will be planning the next Art Happening soon. Drop by if you get a chance. You don’t to be an artist, rather just enjoy art. An Art Happening is one of the best ways to get out and about in Sevierville. The First Baptist Church of Sevierville is producing one of the biggest events that I have seen by any church for any community. They had over 8,000 guests last year. It should break that record this year. Welcome to the 2nd Annual Love Loud Corn Maze! It is one massive, fun, fall afternoon. Take the family and a good camera. I was pretty amazed. Free food ( hot dogs, cookies, ice water, flavored ices, and popcorn). Parking is not a problem. There is a massive gravel lot. The property, across the street from the city park, is over 40 acres. They are using most of that property to share their love with the community this month—and you can feel it. Here is what I saw. A large food tent with beautiful chandeliers. You could smell the popcorn from yards away. A popular item! Flavored ices. Kids loved these, of course. Outdoor games. Lots of corn hole. A local business that provides hands-on interactive (and some classic) games for parties and events. On the photo above, you can see the contact info and phone number. So nice! Funny feet on the left. Corn cob ‘darts’ pictured on the right. Both from Days Gone By. Jerry ‘Bear’ Hyder greeting people at the entrance. Always nice to see the Bear! Can you say hay wagon? It looks as big as Noah’s Ark! My friend Gary posing well. My friend Elaine ready for the opening day. Tiny Tykes Train. Two different kinds! The slingshot game used great precision and was quite popular. Even bigger than it looks here. Animals for the kids to look at. Goats on high. I only walked around the corn maze and was there about an hour and a half. If you go to do everything then you can have quite a good evening there. It would be nice to get there as the sun sets because there will be bonfires, toasting marshmallows, and even more fun. It was an impressive, organized fall festival and I could feel the love. I felt like I was a guest in the Lord’s house. When I got home, I looked for the map to take a picture for this blog. You can see the scope of the First Baptist Church Corn Maze by the map. I didn’t even make it into the maze, but it looks like a massive one. In fact, I only noticed the design of the maze when I came home this evening. Needing a picture, I turned over the map and noticed the intricate design of the maze. I’ll let it speak for itself. A wonderful way to get out and about this month. You will be impressed. See more pictures on the Facebook page for this blog. This link will take you there. Think things are slowing down on the calendar? Think again. Here are some events coming in the next two weeks that could be interesting to do. Finding the time may be the only problem. Here is a two week planner for October 11-22, 2016. First Baptist Church of Sevierville opens the Love Loud Corn Maze and Hay Ride tomorrow. Look at the flyer above for complete info on dates and times. It is a rite of passage in October for corn mazes so enjoy! It is located across the street from the Sevierville City Park. There will be plenty of parking! There will be a Culinary Fair on Wednesday, October 12th at the Walters State Rel Maples Institute for Culinary Arts. Booths will be set up like a city block using the theme “New York Street Fair.” Tickets are $15 for tickets that you can use to buy food from the students. The fair will last for nine hours, until about 7:00 p.m. Check the Sunday edition of the Mountain Press for more information. There will be an Art Happening this Thursday downtown Sevierville. The flyer above has times, location, featured artist, and other information. These are casual, relaxing events where you can meet different artists from the area, view samples of their work, listen to music, and more. Courthouse Donuts/Dyers Downtown is such a nice venue for these events. See you there! The last downtown Sevierville Farmers Market for the 2016 season will be this Friday. Some people will be out for fall break so that will be an opportunity to visit this market one more time for the year. Wine and Paint Party on October 18, 2016 at Hillside Winery. Support Relay for Life. Stomp Out Breast Cancer on Saturday, October 22nd. See the flyer above for details and support Relay for Life! 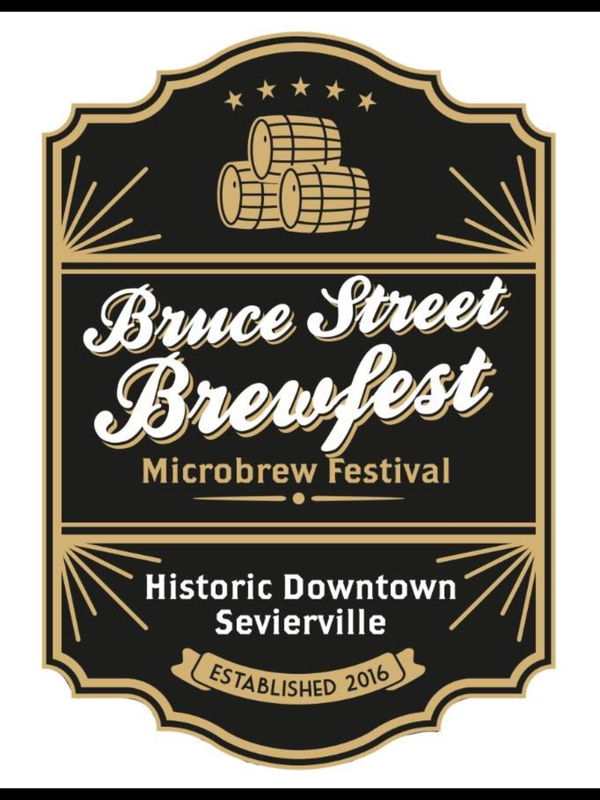 The first Bruce Street Brewfest will be downtown on Saturday, October 22nd from 1:00-6:00. Buy your tickets at the link below. OK, the next event is more than two weeks away, but people need time to plan! 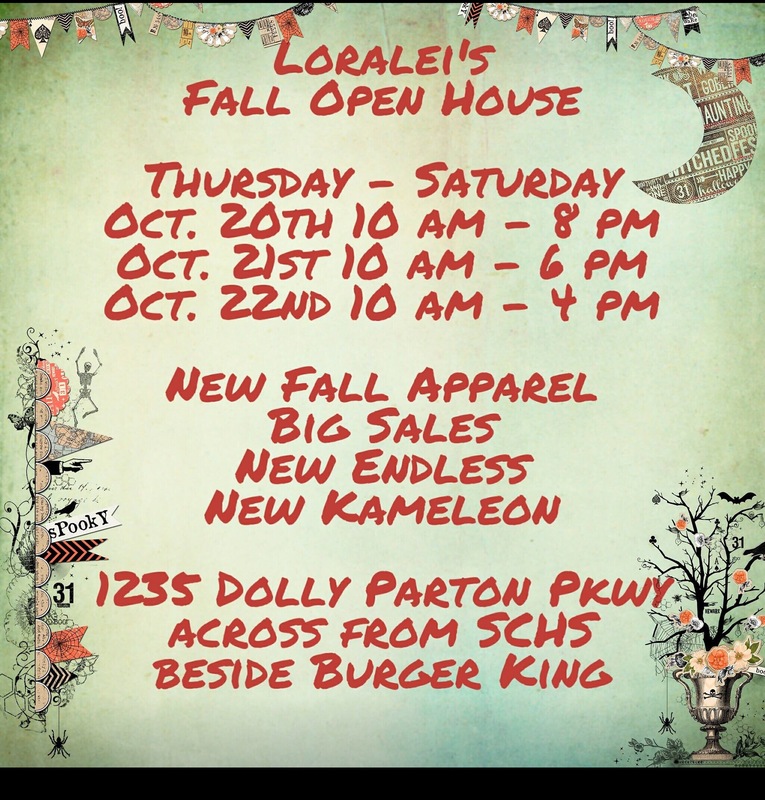 You can see there are many opportunities to get out and about in Sevierville this month. Here is part 2 of my story on the First Responders Challenge event held yesterday at Sevier County High School. What an exciting event for the whole family! The following pictures and videos will give you a look at one of the best events of the year in Sevierville. Fun introductions by Bryan McCarter as teams enter the stadium for competition. My favorite intro was for the Sevier County Sherrif’s Department, but I couldn’t catch it in time on my camera. The fighting Hosses’? Love all the intros. Hard charging Pigeon Forge Police Department was the winning team of the day. Gold! Knoxville Police Department represented Knoxvegas well, winning a Bronze medal. Defending champions from last year, the Alcoa Fire Department. Police vs Fire for Pigeon Forge. More strong competition in Tug-of-War. The obstacle course covers most of the field and provides a lot of excitement! Teamwork to get everyone over top. A big drop down to the other side. The guy in the back crossed that high wall well. I was rooting for him! Sevierville Police and Fire show how to cross the wall. A lot of speed in the video below. Did someone run track in high school? John Hutchens’ former track students? Michael Maddron, coach, pictured left. Bryan McCarter, announcer, center. SCHS track and event coach, John Hutchens. The maze trail is contained within a large truck. The contestants do not know anything about the inside design and it is completely dark. And small spaces! I could see how they bump their helmets on walls and things. I believe the event is timed. To me, this would be the hardest thing of all the events! Look at the small opening in the bottom right. Very small. Full gear and oxygen tanks add more weight too. Officer Akers works out at my gym. I asked why he wasn’t competing, but he said that he was scheduled to work. If he competes next year then look out because he works out hard at NFC. Part of the Shults family outside the Sevier County High School stadium. I think that the sign above applies well to them. My friend Darlene is pictured in the cranberry color. Event Chairman, John Matthews, is pictured to the far right. Have you ever seen anyone pulling a fire truck loaded with 1,000 gallons of water? Timed event. Must pull to cones. Coach Hutchens calling the times! A tough team here too! I had to leave soon after the fire truck pull due to an appointment, but will make sure that I can stay until the end next year. This looked very interesting. A huge container of water with a ladder across the top. In conclusion, the theme of the day was ‘overcoming obstacles.‘ Justin Shults wrote about overcoming obstacles in his life as an essay topic when he applied for a scholarship. First responders overcome obstacles every day. The United Way of Sevier County helps to fund over 15 community groups to help others overcome obstacles. It was a common thread throughout the day. I ended my visit on an uplifting note. It was a good moment to see the Shults family honoring Justin and Stephanie Shults. It is obvious that our community loves this family. Our community also loves Justin and Stephanie. I may have found the best event of the year. It is free, family friendly, involves athleticism, bravery, and obstacles. Welcome to the Smoky Mountain First Responders Challenge 2016, presented by the United Way of Sevier County. Event coaches. Michael Maddron is ready. I entered just as the event began. Plenty of parking and seats so bring the whole family next year. The Smoky Mountain First Responders Challenge 2016 began with a tribute to two young people who were lost in the March 22 bombing in the Brussels airport. As we know, Justin Shults was from Gatlinburg. You can see the picture of Justin and Stephanie Shults in the photo above. Some of the proceeds at this event will fund a scholarship in their names for a student at Gatlinburg -Pittman High School. Applicants must write an essay on the topic of obstacles that they have overcome, like Justin Shults wrote about when he attended high school. At the exact moment that the tribute to Justin and Stephanie Shults ended, I noticed two groups of Canadian geese flying overhead in a ‘V’ formation. The geese were loudly making noise, as if saluting as they flew. I don’t know if anyone else noticed this moment, but it seemed like a supernatural tribute from the sky, punctuating the one going on below on the football field. Time seemed to stand still for a moment. United Way of Sevier County Executive Director, Amy Harper, pictured on the right. Rhonda Bletner, from the Moutain Press, pictured center. Her article in today’s Sunday edition was very comprehensive. Buy one before they are gone! Bryan McCarter was the announcer for the day. I have heard him announce many ballgames at Carson Newman University, but the humor really came out for this event. From the team introductions to the timed events, his comments had us chuckling all day. A really talented sports announcer! Coaches for competitions. Michael Maddron, pictured right, is ready for the games to begin. Teams lining up and listening to how the day will go. I know that adrenaline was pumping! Obstacle course wall and tunnel. That wall was high! Touring the course. Reviewing the rules. Stay tuned for Part 2 of this story. I should publish it later this evening. It will contain more pictures, stories, and a few videos of the event. It is just too big to cover in one story. The Smoky Mountain First Responders Challenge by the United Way of Sevier County was a super charged way to get out and about in Sevierville.